No way to slalom around it — Oregon offers some fantastic, kid-friendly resorts, from Mt. Hood to Mt. Ashland. Here’s your guide to the best in skiing, snowboarding and other family snowplay. This 11,245-foot-tall beauty is the tallest mountain in Oregon, and you can ski 3,690 vertical feet of it. I took my first skittering ski steps in Oregon, sliding-falling down Mt. Hood’s white face. I (eventually) improved here, too — going out for night-ski runs as an older teen. Mt. Hood offers the best of all worlds – a diverse terrain, plenty of kid-friendly ski, snowboard and snow play options, along with a chilled-out après-ski scene for all ages in Government Camp (Mt. Hood Alpine Village). It’s close to Portland, too. It’s one of the more perfect places to learn to ski in the Pacific Northwest. In Government Camp, on Mt. Hood. Photo Courtesy of MtHoodTerritory.com. And even if you don’t like skiing, there’s also sleigh rides, snowshoeing, snowmobiling, snowtubing and more. The ski season here typically runs through Labor Day, and at Timberline, nearly all summer long. Ski school is in session! Daily lessons for kids (including snowboarding lessons for 4-year-old children), half-day childcare-and-lessons, nighttime kids’ lessons, skiing and snowboarding camps for winter and spring break — and there’s likely to be snow here during spring break, even if it’s melted everywhere else. The Meadows daycare really stands out – it’s state certified and accepts babies as young as six weeks old. Don’t miss the page just for families, which spills the secrets of skiing with kids and the Mt. Hood Meadows deal page. Tubing Mt Hood. Photo Courtesy of MtHoodTerritory.com. 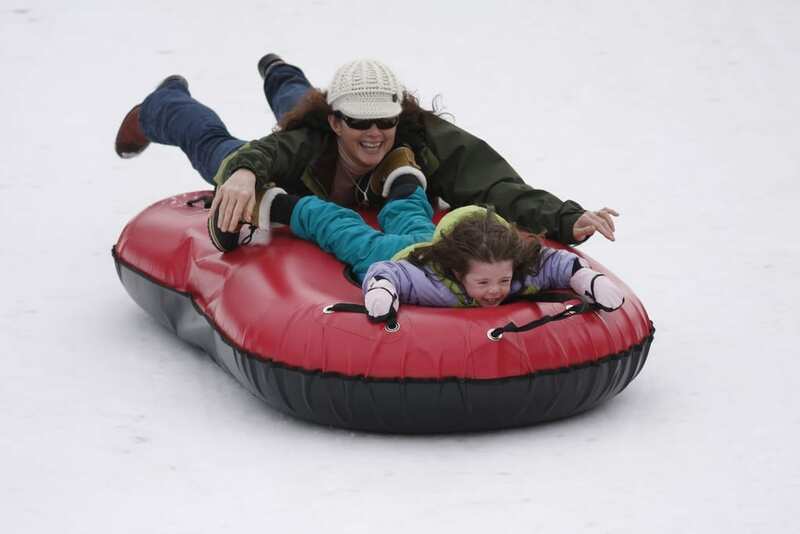 Very popular with big kids and the teen crowd, this Oregon winter resort offers offers daytime and blacklight tubing (“cosmic tubing”) and special indoor heated area for kids (Super Indoor Play Zone) under 48” tall. Kids ages 4-12 can take one-day lessons or four-week ski lesson programs; the all-day program runs from 10-3 with a one-hour break. Since 1927, families have flocked to Summit Ski Area, the first and oldest ski area in the Pacific Northwest. There’s no daycare, and the essentials are fairly bare — but it’s a cheap place to snowboard, tube or ski — or just build a snowman. Kids five and under ski free here, and the bunny hill here is nice and long, so it’s a good place to just practice, practice, practice with your preschooler or big kid. I love Timberline Lodge; it’s like a little piece of history perched on a peak. Timberline pretty much spoiled me for all other ski-and-lodge deals; there’s nothing better than skiing and then warming up next to the fireplace next to ancient beams or sitting in the stain-glass lit Blue Ox Bar with a hearty slice of pizza. If you take the kids here, it’s hard to ramp back down expectations. Visit the snowsport center to learn more about the winter offerings – like kids ski lessons — and even the summer ski lessons. The kids’ lessons are offered for skiers 4-10 and snowboarders ages 6-10; rentals can be included as well, which takes one to-do off your list. The Snowplay program is pre-ski full-day childcare for ages 2-4 and offers indoor and outdoor play opportunities. Unlike the three resorts above, this Oregon kid-friendly resort is located on the north side of the mountain, closer to Hood River. The terrain here is different, and the resort is a laid-back destination. Families can stay at the lodge, take advantage of the “Learn to Ski” program (lesson, lift and rental, starting from $37) or slip through the tubing park. Kids 5 and under ski free here, but if you’d like your kids to have lessons first, Hoodoo offers weekend and holiday ski packages that include rentals and lessons (ages 4-12). Private lessons are offered for ski, snowboard, cross Country and telemark. The small, cute ski daycare takes children from 18 months old, but only takes five kids at a time. Reserve early! Mt. Bachelor might have some of the best sun-lit, dry, light snow in the Pacific Northwest (love those bluebird days! ), and this is one of the largest resorts in Washington and Oregon. The daily kids lessons program feeds kids, teaches them to ski or snowboard and entertains them while you shred the slopes. The three “L”s — lift tickets, lessons and lunch — are all provided. Multiweek programs are also available. Otter Mountain Childcare’s daycare facility takes kids from six weeks old and up in separate infant/toddler and big-kid rooms. If you’d like an alternative to skiing, try going on a sled dog ride, enjoying the often sold-out snow tubing park (arrive 30 minutes early, the site suggests); kids ages 8 and up (and infants in backpacks) can learn about winter flora and fauna on a free 90-minute snowshoe interpretive tour, led by a forest ranger. If you’re seeking an alternative to the often-crowded and very popular resorts on Hood and Bachelor, you may be happy here. This resort offers ski lessons for ages 4 and up, and snowboard lessons for ages 8 and up. No daycare, so it’s best if they’re ready to hop on those skis or the snowboard. Tubing and nordic skiing are available for those who want an alternative to the ski/snowboard runs. Or enjoy the 20 km of groomed snowshoe trails. Sign the kids up for lessons, sleep in the 16-person yurt next to a fire or try nordic skiing. There are only three lifts — this is a very chilled-out resort in Eastern Oregon. Near: 22 miles east of Easton, Oregon. “Great skiing for less” is the motto of Spout Springs. A day pass here will set you back $35 for adults, and $25 for kids, and private lessons (for all ages) are just $35. The place says they avoid “glamour, pretense and crowds,” and that’s probably a safe bet, but there’s still a small restaurant/lounge on site. A T-bar or rope tow will haul you up ($15) at this quiet ski area, where families come for plenty of elbow room and great powder. No lessons, no daycare — just family fun. Here, kids (ages 4-12) can learn from ski and snowboard lesson packages and afterschool ski lessons, while children 6 and under ski free. 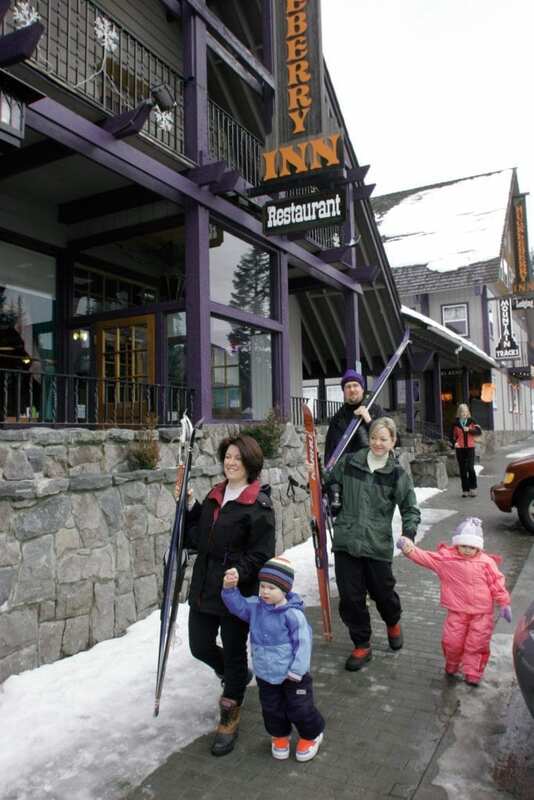 No daycare, but check out the lodging-ski deals and twilight ski at this four-lift resort. Warner Canyon is more toward the less-accessible Eastern Oregon, and ski options here are limited (one chair lift). But there are volunteer-led, inexpensive multi-week snowboard and ski lessons for kids ages 5-18, along with snowmobile trails and nordic ski options. It’s run by a non-profit for the benefit of local skiiers — so if you’re in the area, enjoy the local angle.